We are the most requested and trusted airport transportation and shuttle service in Bel Air Maryland. As a community leader, we try our possible best to offer the safest, prompt, and efficient car service in Bel Air Maryland. Our rates are typically cheaper than the average filthy Bel Air taxi. The cars in our fleet are frequently serviced to ensure your safety, and all drivers are thoroughly screened for your peace of mind, knowing that you will get to your destination smoothly and on-time. 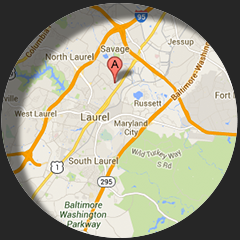 We service BWI, Dulles, Reagan and Philadelphia Airports. Our sedan service kiosk in Bel Air is open 24/7 for your convenience. Other service areas on our map include BWI/Baltimore Penn Station, Baltimore Cruise Ship Terminal and out of state long distance transportation services. If you are in town for business or pleasure, you can also request our hourly car service for a night out with friends, family or business associates at a fraction of what it would cost to use a limo service. It's as easy as a, b, c. All you have to do is make an online reservation on this secured site today, or call one of our customer service specialists at 410-975-8200 to customize you trip for you now. We look forward to hearing from you and have a safe and wonderful trip.